Epidemiologist Steffanie Strathdee and her husband, psychologist Tom Patterson, were vacationing in Egypt when Tom came down with a stomach bug. What at first seemed like a case of food poisoning quickly turned critical, and by the time Tom had been transferred via emergency medevac to the world-class medical center at UC San Diego, where both he and Steffanie worked, blood work revealed why modern medicine was failing: Tom was fighting one of the most dangerous antibiotic- resistant bacteria in the world. 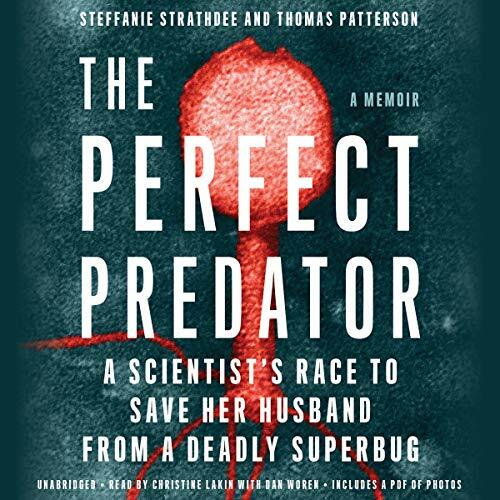 Frantic, Steffanie combed through research old and new and came across phage therapy: the idea that the right virus, aka "the perfect predator," can kill even the most lethal bacteria. Phage treatment had fallen out of favor almost 100 years ago, after antibiotic use went mainstream. Now, with time running out, Steffanie appealed to phage researchers all over the world for help. She found allies at the FDA, researchers from Texas A&M, and a clandestine Navy biomedical center - and together they resurrected a forgotten cure. A fascinating story that everyone should hear! Read this, educate yourself and spread the word. A must read, especially for those in the medical field. This is an amazing story of one woman who assembled a team of brave doctors and researchers to push forward the boundaries of science to fight a superbug and save her husband. This book is more than just her story, it details a momentous moment in history, where phage therapy is approved by the FDA in America. This is paving the way for phage therapy to become a viable addition to the arsenal in the war against antibiotic resistant bacteria. Thank goodness antibiotics are not the only answer! I enjoyed the story and leaning about phage therapy. Really really good. As a medical student i enjoyed listening. Most of the story happened in the ICU. Story from the wife perspective. I recommend it! Don't miss this. An inspirational book about love, science and not giving up. A medical thriller with a heart. Through harrowing experiences, goodness arises and the world changes for the better. Congratulations to Stef, Tom, Chip, Connie, Davey and many others for inspiring us. I am so glad to have listened to this book and have recommended it to friends and colleagues. Incredible story, but the writing leaves something to be desired, namely it needs some editing. Well...actually...it needs a lot of editing. I managed to make it through the book because of the story, not the writing which goes into way too many mundane everyday details. The author's premise seems to be that farmers are making "super bugs" because of what they feed their chickens and pigs, while at the same time saying that her husband picked up his nasty Gram-negative, multi antibiotic resistant bacterial infection most likely as the result of a poorly sterilized medical probe in a small rural medical clinic in Egypt...a clinic which lacked working electrical outlets or even a bedpan that didn't leak. There may be a connection, but the author did not present it well enough for me to pick it up from my reading of this book. Though not related to the story, I must admit, her sideways smirk at the religious customs and beliefs of the Muslim nurses and doctors in the clinic made me squirm a bit as well. The author, a Phd, goes on to admit she regularly seeks the advice of a Psychic, and then has her New Age "wholistic" doctor mumble some sort of blessing over the drugs that eventually save her husband's life. Hardly what I would consider top notch science and it decreases the scientific creditability of the author in my opinion. Do you believe in science or mumbo jumbo? That's the question I kept asking myself as I listened to these parts of the book. Her husband's vivid descriptions of what he saw during his morphine induced delusions, presented as a series of "interludes" add nothing to the story, in my opinion. Sure, I went on some "spirit journeys" myself while I was on morphine after brain surgery. I saw some pretty scary and weird stuff...many people do under these circumstances...but describing what I saw to others is like forcing somebody to sit through a complete stranger's vacation pictures...and that's what I felt like during Tom's "interludes" in this book. This could have been a heck of a hair raising and fast paced story, but it get's mired in the mud of too many details that are not important to the story. It ends up reading like a Facebook posting from a middle aged lady whose husband is on life support, comes close to death multiple times, and finally triumphs. And that's a shame for a couple reasons. First, it's a waste of a great true life story that could have been written in a much more compelling way. Second, we really do need to be worrying about the rising incidence of multi-antibiotic resistance bacteria and learning about the novel approaches to combating the threat they pose. This book, if it had been better written, could have been a platform for increasing public awareness of this issue, but sadly it falls short.